DISCLAIMER: The following article consists of my thoughts regarding some of the recent games in the Legend of Zelda franchise and what some of their themes mean for the wider series as a whole. Some spoilers may be found here related to plot, but I ask that if this interests you that you read on. These games are wonderful and absolutely should be played, regardless of if you know where the story may be going. Nintendo has done a great job in crafting a neat story and games that are fun to play. When I wrote my review of The Legend of Zelda: A Link Between Worlds (3DS), I discussed the fact that the game introduces a brand-new alternate universe called Lorule (a play on the fact that Hyrule is pronounced “High Rule”). Many people have talked about the striking similarities between Lorule and the Dark World seen in The Legend of Zelda: A Link to the Past. Some have noticed one or two small Easter Eggs that reference The Legend of Zelda: Majora’s Mask and have tried to draw connections between Lorule and Termina. These people argue that their theories are backed up by an interview in which it was stated that there would be some familiar references in this new game to some of the events of Majora’s Mask. However, this statement didn’t literally mean that the two games were directly related. Yet, in Link’s house in A Link Between Worlds, players will clearly see Majora’s Mask hanging on the right side of the room. Then there’s the fact that Ravio’s journal in the game discusses a series of critical events spread over a period of three days. Yet, as stated, the comment about familiar references being in this latest game did not necessarily imply that they were directly related. As we know, this game is in a separate timeline from the one in which Majora’s Mask took place. Link doesn’t seem to have ever ventured to Termina in this particular timeline, and so that direct connection is lost. We do know that the Skull Kid seen in Majora’s Mask has existed for a very long time and after being forsaken by his “friends” (who turn out to be the Four Giants), he “goes back to the heavens” (what this exactly means, we don’t know, but more on this later). At some point, he returns to Termina, meets the twin faeries, and travels into Hyrule’s Lost Woods, and sometime after the Child Timeline(s) events in The Legend of Zelda: Ocarina of Time he ambushes the Happy Mask Salesman and steals Majora’s Mask from him. So, if the child version of Link does not exist in two of the three timelines to take part in this story, the question is…what happens? Some have said that without Link having traveled to Termina that their world would be doomed, but in fact we have no evidence of this being true either. We do know that the Skull Kid from Majora’s Mask is the same one Link teaches Saria’s Song to in Ocarina of Time, given comments he makes near the end of the game, so we do know he was in Hyrule. We also know that at some point he encounters the Happy Mask Salesman in the Lost Woods and manages to steal Majora’s Mask from him. Here’s the thing though: in the “future” in Ocarina of Time, we meet the Skull Kid again in the Lost Woods, and he’s scared of Link because of his dislike for adults. Link even has the option to kill him if he wants. This seems to indicate that the course of events in that timeline (e.g. the razing of Hyrule in that seven year interim) has changed the Happy Mask Salesman’s plans in such a way as so that he never runs into the Skull Kid and loses the mask to him. Since the Downfall Timeline would also therefore most likely feature a Hyrule that gets overrun by Ganondorf and his minions in a similar fashion (at least until he is sealed away in Hyrule’s Sacred Realm), this also most likely changed the Happy Mask Salesman’s plans in a very similar way. Thus, all the doom-and-gloom that gets preached about Termina’s misfortune may not be the only outcome. To me, though, it seems like the presence of Majora’s Mask in A Link Between Worlds was simply meant to be a fun little Easter Egg. Maybe in the timeline that this game takes place in, the connection between Hyrule and Termina is bridged more often. Maybe some sort of relationship between the two different worlds exists, or has existed in the past. Perhaps the Happy Mask Salesman sold replicas of Majora’s Mask to people in Hyrule and other lands because they thought it was neat. So, maybe what is hanging in Link’s house is more of a cheap replica that you could buy in the market and not really the “original” Majora’s Mask. Likewise, Ravio’s journal, while certainly a nice nod to Majora’s Mask, is most likely simply referring to events in Lorule before his departure from that world to Hyrule. So now that we’ve talked about why Termina’s destruction really isn’t as assured as some make it out to be, it bears discussion to talk about this concept being thrown around lately that claims that Termina and Lorule are the exact same world. Proponents of this concept point to some minor geographical similarities (such as frozen mountains in the northern part of the map) and they point to the presence of (the replica of?) Majora’s Mask and Ravio’s journal. We’ve hopefully already discussed two of these points already, I would think. It’s true that there are some minor geographical similarities between Lorule and Termina, but to be honest, they are very minor, and if we were to consider them being the same world, we’d have to ask where Clock Town went, where Ikana Castle went, what happened to the large ocean to the west, and much more. Honestly, Lorule has a greater similarity to the Dark World of A Link to the Past, but this should not be read simply as those two worlds being the same either. They aren’t. Instead, Lorule’s corrupted, self-destructing state is due to the fact that their Triforce was destroyed (possibly wished away, as we don’t know exactly what happened) rather than sealed away. In other words, while the Sages sealed the Triforce away in the Sacred Realm in Hyrule to keep it out of the wrong hands, the people of Lorule instead had theirs destroyed, unaware of the fact that its presence was providing life and beauty for their world. This is not unlike how the corrupted heart of Ganondorf warps the Sacred Realm into a world of decay and evil, a reflection of the heart of a wicked being. Since we now know that Lorule has its own Triforce, this brings up the question of whether other worlds also can have them. Lorule’s Triforce seems to say that they can. This brings up Termina once more, in this case to point out the fact that the place that Link first falls into before entering Termina has an interesting reference to the Triforce. Indeed, after Link falls down a seemingly endlessly deep hole (followed by a series of ethereal lights and images in some strange void) he lands in a cave with the Skull Kid, and on the floor, cast down by some bright lights, is an altered image of the Triforce. This Triforce, seen in an image included above, has two fused pieces and one a bit separated from the rest. The size difference of the third piece could simply be due to the angle that the light is being cast. We don’t know why this third piece is separate from the others, though it could be due to how the lights lined up. It also could be symbolic of something, such as their world being (currently) being out of balance. Maybe this removed piece shows the prominence of one of the virtues over the others in this current state of discord. Or, maybe, their Triforce looks different from the others, just as Lorule’s is different from Hyrule’s. What I’m getting at here is that to me, it seems like Termina must have a Triforce of its own. In fact, we see a few images of the Triforce in Termina. In the vicinity of Stone Tower (and inside the tower itself) we see statues of demon-like creatures sticking out their tongues and licking the Triforce. Some have interpreted these to be graven images – a form of sacrilege against the Goddesses and their Triforce. While Stone Tower and the history of the Ikana region mostly remain mysteries, we know given in-game dialogue that the Tower was not built by the people of Ikana or of the Garo whom they are/were at war with. The Tower seems to be of ancient origins, perhaps built by the “Ancient Tribe” that made use of Majora’s Mask in hexing rituals. The Stone Tower Temple contains numerous icons of Majora’s Mask itself, and some theorize that the Ancient Tribe revered the mask and built the blasphemous tower as a way to show their devotion to Majora. Later, when they realize the mask is more powerful than they themselves can contain, it’s possible that they seal it somewhere within the Temple itself, perhaps in the pocket realm Twinmold is fought in (though this is simply presumed through statues found there as well). Yet, the people in Termina really don’t make much mention at all of the Triforce or of the main Goddesses (though they do talk about their Four Giants as well as some other deities). However, the presence of the iconography suggests that their world most likely has a Triforce, but knowledge of it or its meaning has long since been lost. In fact, Link has the ability to purchase a shield in Clock Town that has the symbol of the Triforce on it, so even if the people don’t know what the symbol means anymore, they obviously still think it neat enough to put on clothes and armor pieces. Perhaps, to them, it’s kind of like how a peace symbol is for us. I might even say that the Ikana Royal Family’s symbol may have, in ancient times, been related to the Triforce, and perhaps its meaning was lost over time even to them. Maybe some of the statues seen aren’t meant to be purely blasphemous – maybe just strange abstract symbols from the dead kingdom’s past – while whomever constructed Stone Tower was obviously mocking the Triforce and its meaning (at the time) to the people of Termina. Thus, I think that the area that Link first falls into has some connection to a Sacred Realm in Termina. 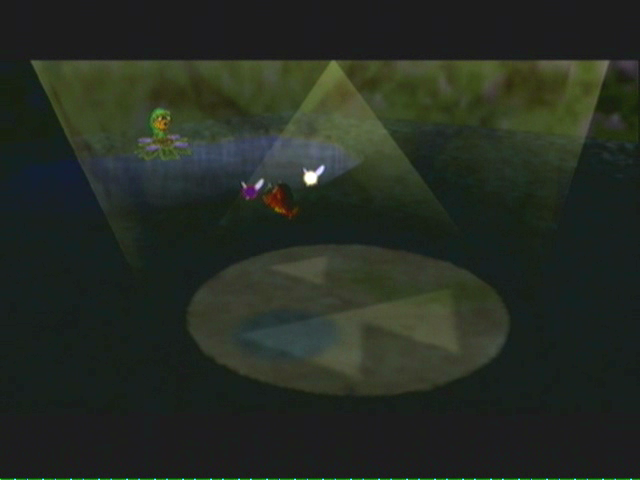 The strange Triforce light seems to possibly indicate this, and this area seems to exist between worlds. Link fell into a huge void with strange, ethereal symbols flashing by, traveled through part of this little area, and then walked down an other-worldly twisting corridor and enters the Clock Tower in Clock Town. I personally feel that the massive door inside the tower is sealing the gateway to Termina’s Sacred Realm, and it’s only when Link passes through this magical corridor that he passes into Termina. The previous area was an area between worlds, not unlike the Sacred Realms of Hyrule and Lorule. Why does this initial area only have three or so rooms we can see? Perhaps we’re only seeing a small pocket of their Sacred Realm. Some have said that the area where Link speaks to the first of the Giants has a resemblance to a heavenly place, so perhaps different access points can access different parts of the Termina Sacred Realm. Also, it’s possible that possessing some kind of special relic when passing through the doors in the Clock Tower and down that tunnel would bring you to Sacred Realm Proper, where you could see the Giants and possibly find their Triforce. 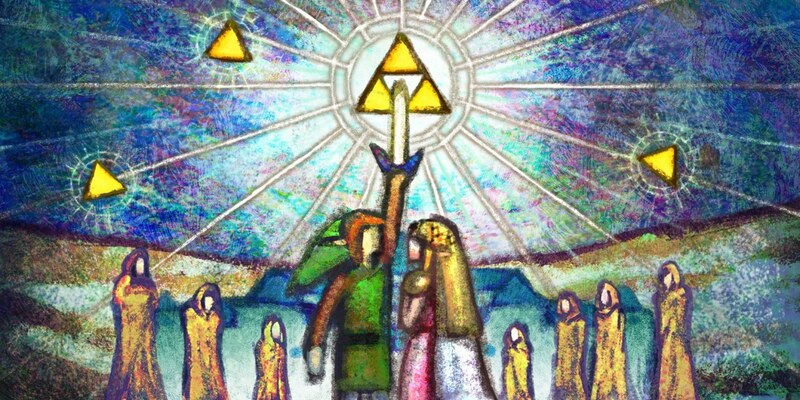 If their Triforce was indeed sealed away long ago, farther into the past than memory serves, this link was broken. Or, and this may be more likely, that initial room that Link falls into that has the “morphed Triforce symbol” in it served as a special doorway, and some ritual or sacred item could possibly be used to open a special doorway that would exit into the main part of the Sacred Realm (in other words, in this “space between worlds,” Link is merely in a cave that could normally be exited when special conditions were met, but for now, that seal is activated and you cannot go anywhere there). Why else would there be a huge iron door inside the Clock Tower that seemingly lead to a dead-end cave in a pocket world? The Clock Tower seems to be their version of the Temple of Time, which lends credence to this theory. This brings me to the last major point I want to get to in this already long article: Demise. Just looking at the inverted Triforce on Demise’s sword has led many to think that Demise has something to do with Lorule. Some have gone so far as to say that they think that Demise comes from Lorule itself (perhaps being the inverse of Hylia, and thus not a pleasant being). One thing to keep in mind about this is that Hyrule and Lorule shared very similar histories up to the events of A Link to the Past (as far as we can tell), so there doesn’t really seem to be any reason to think that Demise is that world’s guardian gone bad. Yet, others have pointed out that Lorule doesn’t seem to have their own version of the Master Sword, and thus they think that perhaps Demise captured their sword spirit (or that the spirit served him much like Fi served Hylia) and used it to forge his own dark sword. Honestly, I think it’s best to take The Legend of Zelda: Skyward Sword at its word. Demise seems to be a primordial being that existed before time itself. He’s the Demon King – the franchise’s version of Satan. Like the Goddesses, he’s a being that has existed before creation, and therefore isn’t merely a mirror of something else. He’s the antithesis of the divine, a being of malice and hatred and destruction. So, Girahim is most likely the chief of his demons and one that he can use to create a powerful weapon out of. It’s interesting to note that his weapon predates the Master Sword, and thus Hylia seems to come up with the Master Sword in reaction to Demise’s blade. Nonetheless, the inverted Triforce seen on the sword, in my opinion, isn’t much different than what we saw on the blasphemous statues in Stone Tower. This symbol wasn’t meant to be a subtle (or not so subtle?) reference to Lorule, but rather was meant to be blasphemy to the Goddesses, much like an inverted crucifix carries generally negative connotations to it. Demise is a being of evil and darkness, and his hatred manifests itself most prominently in Ganondorf in Hyrule, but also most likely as dark creatures like Majora, Bellum, Malladus, Yuga (Lorule’s equivalent of Ganondorf, with Ravio being Link’s counterpart and Hilda being Zelda’s counterpart), and most likely other demonic evils and their hosts. His hatred seems to permeate time and space, making him the great evil of the franchise. In the end, is he any different than Dark Force and the different Dark Falz beings he can spawn in the Phantasy Star series? So…a very long article that gives you (I hope!) a lot to think about! A good way to start off 2014, in my opinion! As always, I welcome your thoughts and feedback!